That’s what we do best! We use both modern water fed pole and traditional techniques to achieve the best result. 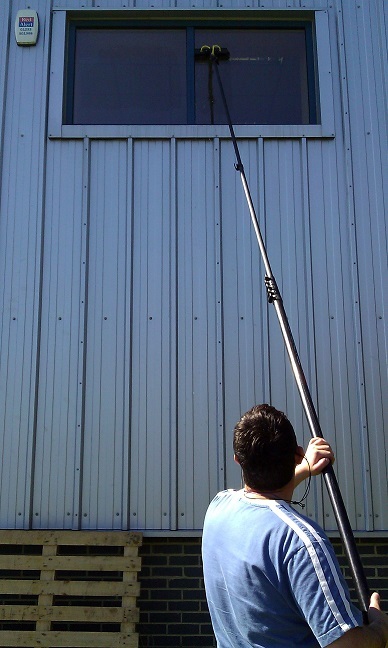 Not only can we clean those hard to reach windows above conservatories but we even have the ability to clean upto 60ft high! We also clean window frames, gutters,conservatories, solar panels and basically anything that needs cleaning! We cover the areas between Ashford, Lydd and Folkestone. Check out the areas covered page to see a map of where we clean. We want to make our customers feel like customers and not just another quick buck. If your not happy with the results, let us know! We will take the time to make sure the job is done properly and most of all you are satisfied with the results! Through our experience we have realised that alot of customers have experienced bad results with the Pure water technique of cleaning windows. Most of the time this is down to operator error due to inexperience. Unfortunately not every window cleaner is a good one. If you have any fears we can offer a free demonstration to give you peace of mind. Be rest assured as Gillies Cleaning has built its work on reliability, hard work, friendliness and good old honesty. So if you have any problems whatsoever just let us know and we will be happy to help.